Many years ago I wrote about a strategy how to invest when you can afford contributing only 50 or 100 dollars a month into your account. I posted my article many years ago that I cannot even find it on my blog anymore to reference it. I still like the strategy as a great alternative to saving into a savings account. What I didn’t like over time was the investing vehicle I used in the past. Let me describe it briefly. If you have only a few dollars to invest every month, how would you invest it? You probably noticed that with a small money available to invest every month you cannot do too much. If you contribute $50 monthly, you cannot invest it right away. You do not even want to invest such small money at all! If you do it and buy a few shares of your favorite stock, you immediately lose money. Here is a great idea how to invest 50 or 100 dollars monthly and still be able to create a money making machine and stay profitable. If you can afford contributing only 50 dollars monthly and regularly invest that contribution into your favorite stock which trades for example at $35 a share, you would be able to buy only 1 share per month (in average). Then you get hit by a trade fee. If your broker collects a fee, let’s say, $7 per trade (and that is a low fee since most of the brokers take around $9 per trade), you are immediately hit by a 20% loss! That is, if you are lucky and the stock doesn’t fall right after you buy. Heck, 20% loss is a huge loss! Your stock will have to make 25% gain just to get break even! How many stocks can do that in a short period of time? I have been holding some stocks in my portfolio, such as Realty Income (O), for several years and yet this stock just reached 25% gain. After 2 or 3 years! If you, within a minute, suffer a 20% loss you will have to wait 2 to 3 years to recover it. Unless you start trading riskier stocks, which will never be dividend growth stocks. With such odds against you, you may never be able to retire. My original idea was to invest in “Non-transaction-fee” mutual funds. Of course, there are other ways how to invest small money such as saving it in a savings account, or in your brokerage account and wait until you save at least $1000 lump sum. After you save this amount you can invest it into dividend paying stocks. Another option can be a DRIP strategy or you can open an account with Sharebuilder, which will allow you investing in smaller increments of a stock. A friend blogger has been using this strategy for many years and he publishes about his trades on his blog “Accumulating Assets“. You can check yourself how powerful an automated DRIP investing can be and how fast your portfolio will grow even when you only invest $50 monthly. If you are like me, you probably won’t be satisfied with such style of investing small money. I am not rich nor my accounts have thousands of available cash to invest. I am a saver and investor. I also pay my debt. But I understand how important it is to create a well funded retirement account, investing account, and an emergency account and all that amid a potential financial stress you may experience with your family budget, school expenses, or just when you paying off your debt. In the past, my savings always helped me to go over my financial hurdles. This experience made me always trying to save as much as possible. Many times, I could only save $50 or $100 per month depositing it into my retirement or taxable investment accounts.Non-transaction-fee (NTF) mutual funds looked like a great opportunity for parking my money before I could invest them. This type of mutual funds allowed me to buy shares without paying commissions. I could buy as little as one share and pay absolutely nothing in fees. After 180 days of redemption time I could sell a portion of the holdings and buy dividend stocks. But there was something I didn’t like about investing into NTF mutual funds. I read about mutual funds and realized that I didn’t like them. They were expensive, charging high fees and ineffective in keeping up with their benchmarks. I completely stopped investing into mutual funds. You can read about my reasons for stopping investing into mutual funds in my older post Why I dumped mutual funds from my investing strategy. For the time being I chose to keep my cash sitting in my brokerage account. But they earned nothing. And I hated when my cash was sitting in the account making zero interest. …you don’t [want to] have a mountain of debt hanging over your head. If you do, focus on paying that off first! Paying off a credit card at 18% interest will give you more bang for your buck than investing in the market. This statement goes hand in hand with my recent awakening when I found out that I was paying $4000 annually to credit card companies in interest. I could fund my ROTH IRA with this money instead. But then he mentioned “commission free ETFs” as a tool for investing small money. I am not saying that I didn’t know about this type of ETFs. I just totally forgot about this investing opportunity. A zero transaction fee ETF can truly be a great tool for everybody to build a strong portfolio. Vanguard’s Total Stock Market ETF (VTI) is available commission free from a number of online brokerages. This ETF invests in over 3000 stocks, representing the entire U.S. stock market. At the time of this writing it was trading for around $83/share. That means you can take that $100 your grandma gave you for your birthday, buy a share of VTI and automatically be diversified across each size and sector of the US stock market. It really is that easy! Buying VTI will give you all the exposure you need to the US stock market. If you want to add a little international flair to your holdings it’s as simple as buying VXUS which is Vanguard’s Total International Stock Etf. For $50/share (as of writing) you can gain exposure to foreign stocks across the globe. China, Brazil, Japan, Germany, India, England…you name it, it’s in there. Next up you can add a little more stability to your portfolio with Vanguard’s Total Bond Market ETF (BND) which gives you exposure to the entire market of investment-grade bonds in the United States. See! Who says you need a lot of money to invest?! You can take $500, invest in all the worlds stocks, the entire US bond market and still have $18 left over for pizza! After your initial investment you can just keep adding to your shares of those 3 investments any time you have some extra cash lying around. You never have to worry about owning anything else, just keep watching your investments grow! You can do this in a Roth IRA, Traditional IRA or a taxable brokerage account, the choice is yours. What about the dividend growth strategy and commission free ETFs? There are ETFs out there, which may be able to satisfy this strategy. I am not proficient in evaluating ETFs since I haven’t invested in them too much. I only have a very little experience when I invested in ETFs in my early years in 2006 – 2007. If you are an experienced investor successfully investing into ETFs and would like to write a guest post about how to evaluate ETFs or closed-end-funds, please contact me or send me your post. I will happily publish it. Even today I have two accounts in which I save $50 – $100 monthly. These funds are sitting in those accounts without making any interest or dividend. I hate it. Jay’s article brought me an idea of finding an ETF which would work like a dividend paying stock, and allowing investing small money at the same time without being hit with a huge loss via commissions and fees. How to find a commission free ETF? It has the highest Distribution yield (3.50%). It has the highest Dividend yield (3.44%). It reached 52 Wk high resistance and it looks like it will continue into correction which may offer a good entry point. It is exposed to European stocks and I have no international exposure in any of may accounts. I like the European exposure. The European markets are beaten down by the debt crisis. But this ETF invests into individual companies such as Allianz SE, Unilever NV DR, Anheuser-Busch Inbev SA, Siemens AG, etc. These are high quality companies. For example Siemens is a well known and strong German company with wide moat which will prosper even in this debt crisis environment. It is a public secret, that German industrial companies are currently making tons of money thanks to this debt crisis (unlike people and companies in other regions). This debt crisis will not last forever. In 5, 10 or 20 years the situation may be completely different and as Europe will prosper once again, this ETF may become a winner. I decided to trade this ETF and invest small money in it. I will use a contingency order strategy. That means that I want to track the stock on its way down to get the best possible entry price. From the chart above you can see that the stock reached its resistance formed by a previous peak in January 2013 and bounced off of it. The stock may do two things now. It may continue up, or it may go down into a correction. 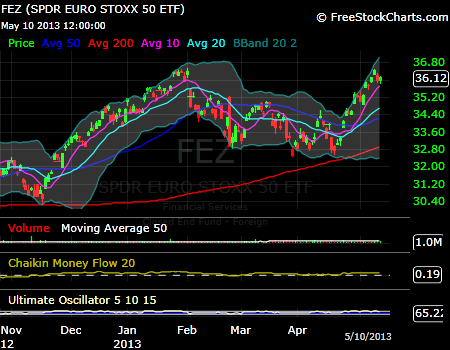 If the stock continues up, the contingency order activates the limit order and I will buy 2 shares of this ETF. If the stock continues down, the trade trigger will remain active and I will just continue lowering the activation price. I am expecting this stock to go down to its 50 day MA. This is a great article. My wife and I are just getting into investing after having paid off all of our debt and we didn’t really know where to start. Commission free ETFs sound like a very good option until we get a decent amount saved up. Thanks for the overview. Jake, I think this can be a great option to let small cash work for you. However there is a catch. If you want to use commission free ETFs to save money in order to sell later and buy a stock, you may be dealing with price fluctuation. This I believe can be offset by buying ETFs which pay dividends. Thanks for stopping by and commenting. I really appreciate it. This is great information. I have always wondered which are the good ways to start investing with such a small amount. I never looked into a DRIP, but it looks possible. Thanks for putting all of this together. Grayson, I think it is a great idea how to start small and not being ruinned by fees. Thanks for stopping by. Thanks for the mention! There are a bunch of dividend specific ETFs which can work for someone investing a small amount of money. I know a few of them can be found commission free (from my broker, at least). I don’t really know how they stack up vs a DRIP plan, as I’ve never given them much of a look myself. Jay, you are welcome. It gave me an inspiration to write my post up. I bet there are many dividend ETFs. I just am not that familiar with them yet, but definitely give them my shot. Also not all brokers offer commission free ETFs, so my screener returned only 5 results.